Falling asleep in outlaw country. Falling asleep in Boot Hill Bed and Breakfast in outlaw country, the Wyatt Earp room. Falling asleep in outlaw country with the sounds of the trains whistling down the tracks. Falling asleep in outlaw country, in the heart of Dodge City, Kansas. Falling into a deep blood sleep and dreaming of someone reading a poem in a ghost shirt where the bullet holes are very black patches. Dreaming that the ghost shirt won’t keep death away but instead will call down the poems one after the other and the poet has all he can do to write them out on pieces of scrap paper and then read them except that the reading is a telling, that the reading is a long chant down a count the coup wind, that the poems are stories and during the telling they come off the poet like billows and strings of wounded smoke. Saturday night, September 12th, 2009, the Carnegie Arts Center, Tony Moffeit is singing A Piece Of America’s Heart, is singing A Back Street Called The Blues, is singing There Ain’t No Light, all new songs and they are almost like a mixture of honky tonk wise guy and the big dark elegy blues, they are restrained and sad and have a hint of duende in them and suddenly I am thinking about Kell Robertson’s music, especially those songs on that home made cd that he sent me back in 2003. A song like When You Come Down Off That Mountain, and I can hear his slightly off key boozy twangy fucked up broken voice half yelling the barroom bossy in my ear. “Honey, it ain’t no picture show.” And, between Tony’s new songs and Kell’s old songs, I couldn’t help but write something down. I scrawled it on the inside of old manila folder while someone drove by outside playing loud music about some rapper who gets gunned down out on the Sunset Strip. I always get a little crazy in Dodge and am not sure why except that it feels like the air there is so thick with all the great stories all I have to do is reach up and get hold of one. They are like the bones of old movies ripe for the taking. Rick Terlep is playing a hard riff on his dark guitar. He has his head bent down and I know he’s not really looking at the floor. I know that he is really staring into the heart of the music which sleeps somewhere under the old brick streets of Dodge and even deeper than that, it sleeps somewhere down in the heart of primal Kansas, somewhere down in the dreamcore of a mythic america and he is using his guitar to conjure the music right out of the bone sacred earth. Kell Robertson, unidentified song lyric. 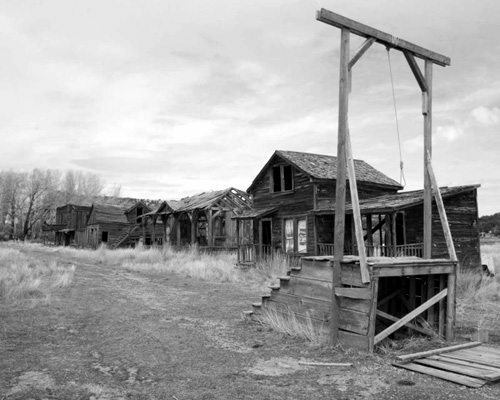 There is a part of Dodge City that has forever been thrown out of the acceptable culture, barred, exiled, condemned, 86’d, outlawed. Just like an Outlaw Poet who dares to write those quick poems of bright nightmares and unrelenting murder in Dodge City light. And, yet, it’s that sense of outlaw and exile and being marooned out on the high plains with the visions of coyotes and wolves that I love. Dodge just sits there on that old coup stick ghostdancing ground with the wind blowing the green black promise of tornadoes in that crazy slant light, in that blood light of old cattle hides and buffalo hides and rancid scalps and shattered bones, crowned with that tangle of old high talk, the gun brag, the bad whiskey, the shot horses, and the lost lost dreams. Poem by Tony Moffeit, from MIDNIGHT TRAIN TO DODGE, Kyle Laws, editor, A Pueblo Poetry Project Publication, 2009. I’ve only been to Dodge City a couple of times but the one thing I’ve noticed while I was there is that something comes over me I call Dodge City Longing. And, I don’t think it’s new. I think the feeling has always been around. Say that it exists somewhere between love and mayhem. I’m sure Wyatt Earp felt it those nights when the killer winds brought waves of black snow and those lunatic dreams. I’m sure Doc Holliday felt it when he raked in the last pot of the evening and all he had left was his hotel room and all those demons dancing in the air over his bed. I’m sure Ed Masterson felt it when that 45 slug hit him point blank range and he was swimming in blood while his clothes were burning. 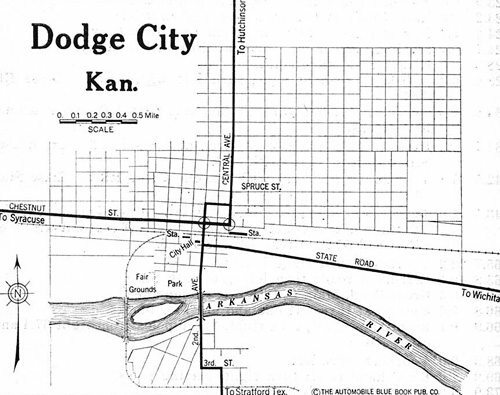 The Dodge City Longing is purely american. You can feel it in Akron, you can feel it in Peoria, you can feel it in Iowa City, you can feel it in Telluride but where you feel it to the max is in Dodge City, Kansas, because that’s where the big gamble was, that’s where the gunfighters went, that’s where the dream money was sleeping, that’s where the blood was waiting for even more blood. And, still is. And, that’s why it’s so easy to read Outlaw poems there. That’s why it’s so easy to read BLUES FOR BILLY THE KID there. Tony Moffeit is reading me something from his KID novel and for a minute or so he starts to look a little like Billy. Like he is shapeshifting himself into the Kid. He has always had high cheekbones, he has always had the same loose outlaw stance as the Kid. But, now he is shapeshifting himself into the Kid’s legend and dreams and meta skin which is also a body and in the process he blurs back and forth like a multi faced Picasso painting, like a Bill Gersh print of the dark lady diving into and out of her black gypsy night, like the kind of photograph he has been experimenting with where the shapeshifting has become the one thousandth exposure of a Billy the Kid smile which was his real weapon because that smile completely disarmed you put you off your game just long enough for the Kid to get his gun out. And, that’s why it’s so easy to read Kell Robertson’s The Gunfighter there. Just before I read at the Carnegie Art Center on Friday night, I read The Gunfighter to myself again in a mirror maybe for the ten thousandth time. I don’t know why I did that. Maybe it was a kind of psychic proxy reading for Kell Robertson because he couldn’t be there and I wanted some phantom version of him to be part of what was going on during that weekend in Dodge. Or, maybe because it was one more way of conjuring that cracked stick duende that Dodge City has become. Outside, I keep looking for a black wolf to walk down the railroad tracks. 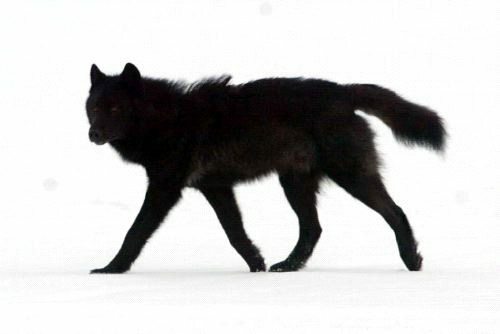 A black wolf in search of its original shadow. And, that’s why it’s so easy to read anything from DILLINGER there. Especially an excerpt from The Riddle Of The Wooden Gun. Because the authentic wooden gun had been a kind of shaman stick, a magical way of pointing and talking. I wanted to call back all of that energy that Dillinger had originally known at Crown Point jail, call it all the way back to Dodge City and somehow make it work as it had never worked before. What I wanted to do in the writing of the poem and what I try to do in every reading of the poem is to join the first murderous energy of the wooden gun to the ghostdanced power of homicidal love pushed back in the breath. There is an old legend that Wyatt Earp whittled a wooden gun in Dodge City while he was a deputy marshal there and carried it tucked inside his boot for good luck. And during the Gunfight at the O K Corral that wooden gun shook right out of his boot and got lost in the dust and Burt Alvord found it and later took it to Mexico City where it somehow ended up in a curio shop. Then, Malcolm Lowry bought it and allegedly gave it to Maria Sabina during a healing ceremony. Ironically, Sam Peckinpah liked using an old wooden gun to signal good takes while he was filming BRING ME THE HEAD OF ALFREDO GARCIA in Mexico. Where he got it no one knows for sure. One very dubious account has George Stevens mailing it to him. Apparently, the note read, This is the wooden gun that Brandon De Wilde used in SHANE. You deserve it for THE WILD BUNCH. Warren Oates claimed that Peckinpah liked to tease Gig Young with it. Young wanted that wooden gun more than anything else in the world. He even offered Peckinpah a hundred bucks for it but Peckinpah wouldn’t part with it. Then, on the last day of shooting Peckinpah gave it to a Yaqui who had been working as a gofer on the set just to aggravate Young. No one knows how it got from the Yaqui to William S. Burroughs who liked to stage gunfights with his reflection in a mirror. He often used real guns but sometimes he would substitute the wooden gun just for the hell of it. A Mayan shaman who knew Burroughs claims that the wooden gun eventually got lost in the mirror. And, the wind in america is filled with old sticks that sometimes resemble powerful dream pistols that promise to take us away. Stories are blood. Found scrawled in white chalk on a broken sidewalk in Dodge City, Kansas. 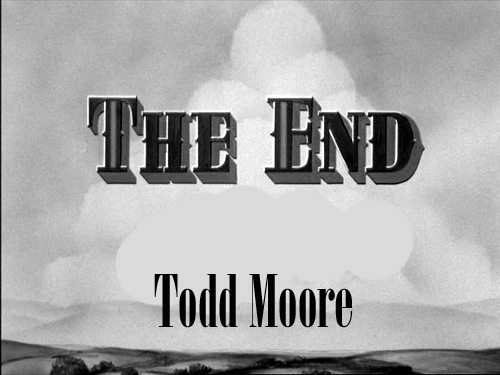 This entry was posted in Todd Moore and tagged falling asleep in outlaw country, Kansas, Kansas City, Kell Robertson, Outlaw Poetry, Poetry, Todd Moore, Tony Moffeit by Monsieur K.. Bookmark the permalink. THIS IS FLAT-OUT A KNOCK-DOWN, DRAG-OUT, ALL-OUT CLASSIC! THE GREAT TODD AND KLAUS CONNECTION MAKE THIS A MINI-MOVIE WITH MYTH MIXED WITH REALITY!